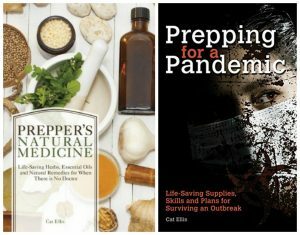 On this episode of Herbal Prepper Live, we are talking about yarrow, Achillea millefolium, often called “the battlefield herb” for its ability to stop wounds from bleeding. Listen to this broadcast or download “Yarrow The Battlefield Herb” in player below! Yarrow does a bang up job to help control a bleeding wound. It has a long history in wound healing, from calming inflammation, to soothing spasms, and of course, stopping the flow of blood from wounds like lacerations and internal bleeding. 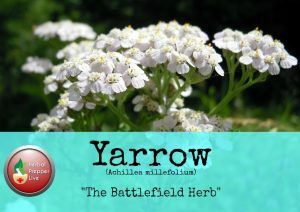 Granted, yarrow is known for controlling blood flow, but that isn’t everything for which yarrow is used. Achillea millefolium is so much more than a styptic (substance that stops bleeding) or a general vulnerary (substance used to treat a wound). Yarrow has further applications for the liver, winter colds, reducing fevers through sweating, insect repellent, a treatment for baldness, and even brewing beer. Yarrow is found in both grasslands and forests from Asia to Europe, and all over North America. The only places where you will not find yarrow growing in these regions is in the desert. This is an accessible for most of us in the United Stated. Due to yarrow’s wide habitat range, you could reasonably rely on wildcrafting Achillea millefolium each spring. If you wanted to make sure you had your own, dedicated supply, yarrow makes for an easy to grow perennial in most herb and flower gardens. Yarrow can also be grow as an annual in desert regions. There are some contraindications, as well as situations where other styptic herbs may be a better choice. I will cover these in this episode as well. 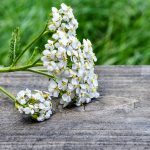 Given this ease of access to the plant, and its affinity for wound care, every prepper should familiarize themselves with yarrow and how to use it effectively. Next: Next post: Odor: Horses Sweat, Men perspire and Ladies glow!